Once again, Research In Motion is promising its developers that great things are in store if they will just have a little more faith and patience. For going on a couple of years now, the BlackBerry maker has been pitching coders on the virtues of its next-generation operating system. But the software still has yet to find its way onto any phones, and the PlayBook tablet — its lone device feature, the QNX-based operating system — has fallen flat. RIM is assuring developers and customers that the first BlackBerry 10 phones will arrive early next year, following several delays. Not surprisingly, developer interest has waned amid the delays and the company’s declining market share. According to a recent survey from Appcelerator, the number of mobile developers that are “very interested” in building apps for the BlackBerry phone declined to an all-time low of 9 percent, down from nearly 40 percent as of January 2011. 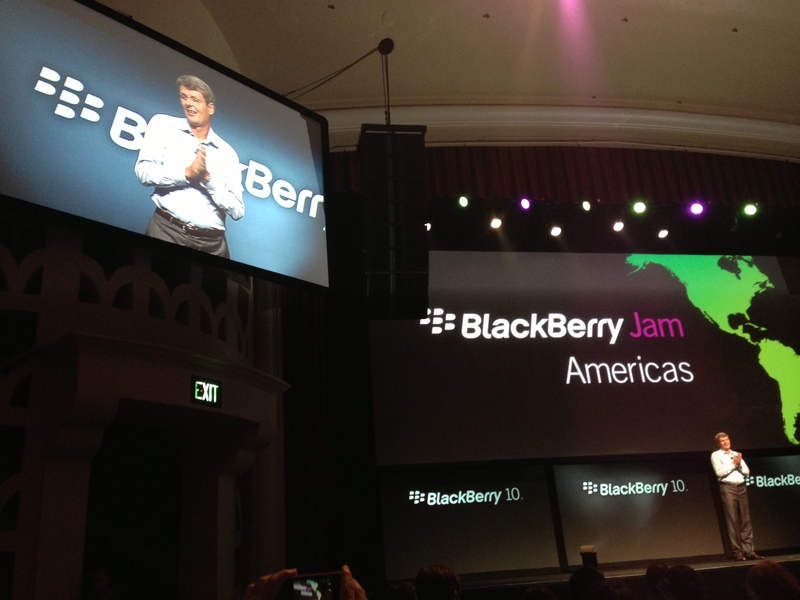 Aiming to woo those who remain, and perhaps lure a few off the fence, RIM is set to address a crowd of developers later on Tuesday, as it kicks off its BlackBerry Jam Americas conference in San Jose. AllThingsD will have regular updates once the event begins in a few minutes. 8:25 am: Loud techno music and spinning disco lights. Just what everyone wants at this hour. 8:31 am: RIM CEO Thorsten Heins takes the stage. “There’s actually no other place I’d like to be right now,” Heins said. Um, good, I guess. Heins promises a new era of mobile computing that brings forward the best of BlackBerry, including productivity and security, but tailored for devices that have nearly the power of a laptop. 8:33 am: Heins promises a shift away from current mobile platforms with their “in and out” approach to apps, with the main navigation being the home button. The BlackBerry Hub, a feature being shown off for the first time on Tuesday, allows users quick access to their email, social network messages and other time-sensitive info. 8:35 am: He gets in a good jab at Apple, noting that the new BlackBerry 10 devices will use the same HDMI and USB connectors as past devices. “We all can save some money,” Heins said. 8:39 am: Heins also promises a keyboard that people can actually type on — on both all-touch devices and those with a mini-keyboard. The basics are all better, including a “killer, fast browsing experience” and improved camera and multimedia abilities. “Make no mistakes, we have the must-haves,” Heins said. 8:42 am: Heins said RIM is lining up carriers to make sure there is lots of support for the first crop of BlackBerry 10 devices. Heins said he is on a carrier road show, and just got back from Southeast Asia where, in some markets, BlackBerry adoption still outpaces smartphone growth. 8:45 am: Enterprise customers are also excited, Heins insisted. My first journalism professor said one of the most important rules is to “show, don’t tell.” Heins is doing a lot of telling. 8:47 am: An update to the BlackBerry developer tools is coming today. “BlackBerry 10 is on track,” Heins said, promising devices are just “a few short months away,” with carrier testing starting shortly. Heins said RIM is making believers out of people who had previously written the company off. He also thanked developers for their patience. 8:50 am: Heins apparently was thinking the same as me, noting that showing is better than telling. With that, he brings out a colleague to show off BlackBerry 10. 8:51 am: RIM is showing BlackBerry Flow, the company’s design interface. Another feature, BlackBerry Peek, lets users glance at the hub from any application, without leaving the program. A right-angle sort of gesture pulls up the hub from anywhere else in the system. 8:56 am: A “people” feature lets users see not just when the next meeting is coming up, but who is there, as well as those people’s status updates and information on the last interactions with those people. 8:57 am: Heins notes that all that is done with one thumb, so it can be done while grabbing a bag and rushing through the airport. 9:01 am: The BlackBerry Balance feature separates work and personal use of the device, allowing corporations to set rules for one part of the device, and give a worker more freedom in the personal side of things. There are separate browsers in each, with information in the corporate side kept from being moved over to the personal side. 9:06 am: Heins said there is more to the new operating system. “What we’ve shown you right now is just a glimpse of what is coming,” Heins said. A software update will allow developers to run some of the features shown Tuesday on the “Dev Alpha” prototype devices given to BlackBerry programmers. 9:08 am: The company now has 80 million users, up slightly from prior quarters. Some analysts predicted that the company might actually see its user base dip this quarter. RIM reports full quarterly earnings on Thursday. That gives way to a cover of REO Speedwagon’s “Keep on Loving You.” Words can’t describe. Uploading video clip to YouTube now. 9:14 am: In the meantime, BlackBerry developer head Alec Saunders has taken the stage. 9:17 am: Saunders is making RIM’s multi-pronged pitch to developers, promising them they can write in HTML5, native code or even customized Android apps. Saunders is pitching how developers can integrate their programs with the BlackBerry Hub, allowing customers easy access to their apps and time-sensitive info. 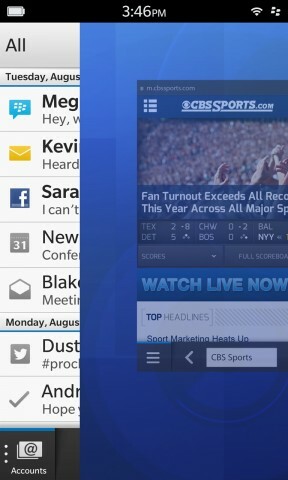 One way to think of BlackBerry Hub is something of a unified-inbox-meets-notification-center. Although RIM is offering several options for developers, Saunders said they will make more money if they develop programs that run natively on BlackBerry 10 and take advantage of features such as BlackBerry Hub. 9:21 am: RIM is also releasing to developers a Dev Alpha B, an updated version of the prototype hardware it has been giving programmers to test out their BlackBerry 10 apps. 9:22 am: Did I mention that you have to watch this video? Seriously. I haven’t seen a tech company video quite this, um, special, since Texas Instruments’ in-house band crooned about DSPs a decade ago. 9:25 am: Loud video playing telling the crowd the 10,000 reasons to believe in BlackBerry 10. Thankfully, it is a reference to their $10,000 promise to developers who build apps, rather than a list of 10,000 reasons. Saunders is encouraging people to tweet to #bb10believe. 9:27 am: Now up, Martyn Mallick, VP of global alliances for RIM. Let’s see if RIM has any big new deals to announce. 9:27 am: Farhad Manjoo notes that the RIM video has only gotten “dislikes” on YouTube thus far. No accounting for taste. Meanwhile, Mallick is showing off some slides of publishers and media brands that are building for BlackBerry 10. A&E, the History Channel and ESPN are a few that Mallick called out, promising that the slides represented just the tip of the iceberg (insert BlackBerry/iceberg joke here). 9:31 am: Mallick promised Facebook, LinkedIn, Twitter and Foursquare will all be available at launch. 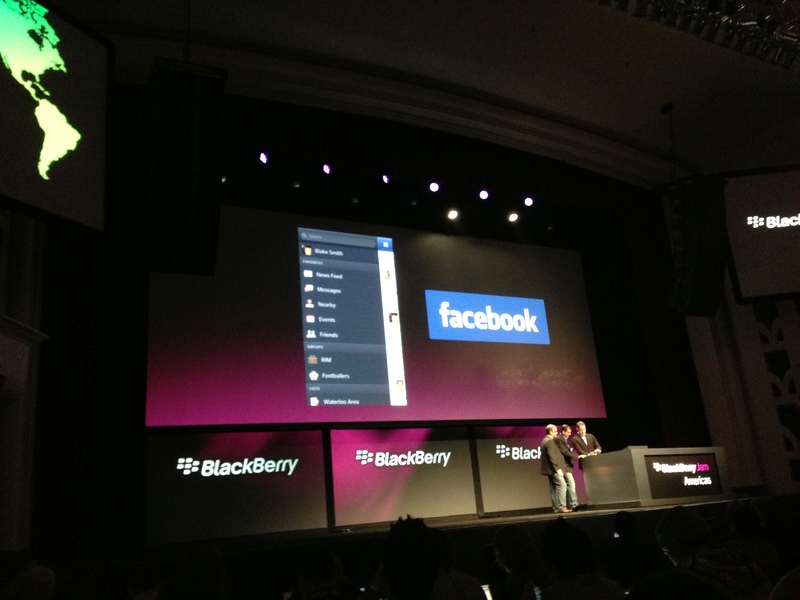 9:35 am: On to App World, BlackBerry’s built-in app store. BlackBerry 10 store will allow renting or purchase of videos, and music purchase by song or album. 9:41 am: Here’s an AllThingsD video demo of BlackBerry 10 in action on one of the new Dev Alpha B devices. 9:42 am: Saunders is offering up the details on the BlackBerry program that guarantees developers will earn $10,000 if they meet certain criteria. They have to submit their apps by Jan. 21, 2013, and earn a minimum of $1,000. If they reach that level, but not $10,000, RIM will write a check for the difference. 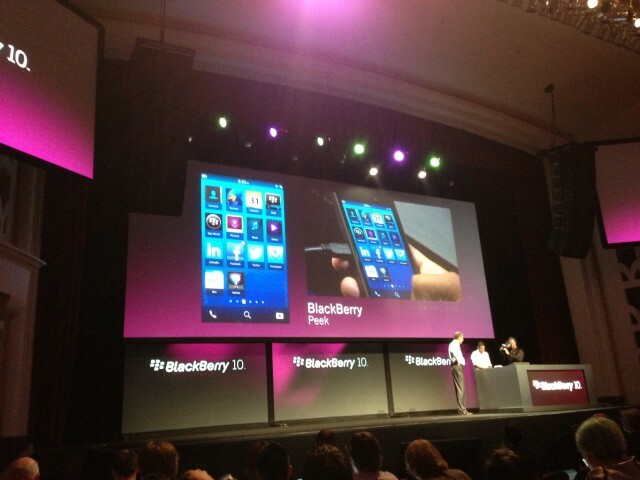 The company will start taking BlackBerry 10 app submissions on Oct. 10 (10/10 for BlackBerry 10, Saunders explains). 9:44 am: Developers who submit their apps by the January deadline will also be able to exchange their Dev Alpha device for a limited-edition BlackBerry 10 phone. Saunders also cited a third-party study that finds BlackBerry developers earn 4 percent more than iOS developers per app per month, and 35 percent more than Android developers. At the show, RIM has a “porting lounge” to help developers move their apps from other mobile platforms; the company also plans events in various cities in the coming months. 9:49 am: Now up, Don Lindsay, head of user experience design for RIM. Lindsay is, not surprisingly, talking about the design elements of BlackBerry 10. Lindsay is talking more about the “peek” feature, which allows users to glance at another app without constantly going back to the home button. The thinking behind peek, Lindsay said, was to allow apps to take up the full screen without any navigation and yet still allow easy access to other information. Getting other information, Lindsay said, should be as easy as looking at your watch. Peek, he said, keeps you in control. “At the risk of making a really bad pun, I hope I have ‘peeked’ your interest,” Lindsay said. 10:00 am: The head of development tools is on stage to talk APIs, SDKs, and other nerdy subjects. But I have good news. RIM has posted the full video of that REO Speedwagon cover on YouTube (I only had a short clip). 10:09 am: RIM said that the updated software development tools aren’t final, but promised the company won’t change the major programming interfaces between now and the final release. 10:11 am: First non-RIM speaker of the day, more than 100 minutes into the keynote. 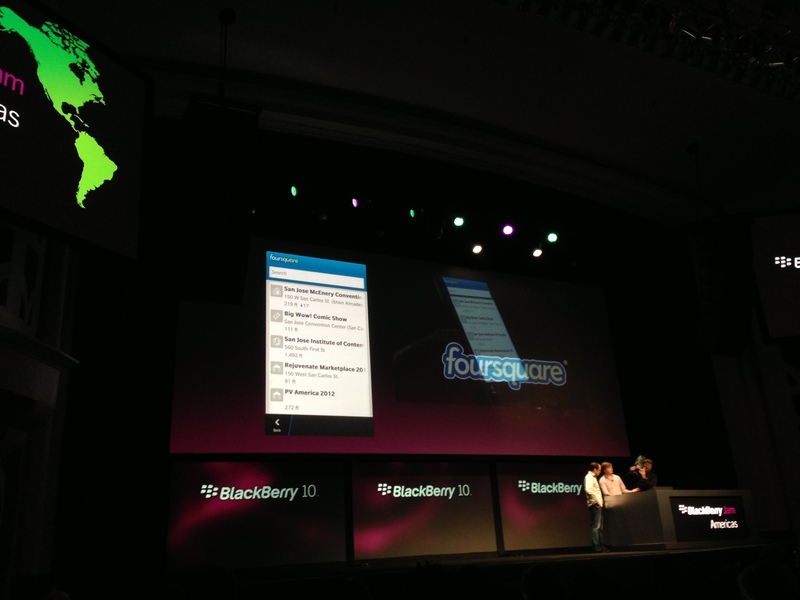 It’s Pete Nofelt, a senior software engineer from Foursquare, showing off a BlackBerry 10 version of the location-based services app. Some 250 Million check-ins have come from BlackBerry, Nofelt said, leading the company to develop for BlackBerry 10. 10:15 am: Another partner, Cisco, onstage to talk about WebEx for BlackBerry 10. One nice feature: It can call you when a meeting is starting. No remembering dial-in codes. 10:21 am: Sean Paul Taylor, who works in the gaming area, is onstage to announce and demo some games that are in the works for BlackBerry 10. Gameloft’s Shark Dash is the first demo. Seems to be some kids’ game with a bathtub and fish. 10:24 am: There’s some other games, too; a multitouch shooter from a start-up is currently being shown. The message here: Having some good games is important even for the productivity crowd, and RIM is on it. 10:35 am: Keynote still going. BB10 browser getting a demo, with RIM promising it is the highest-scoring browser on HTML5 benchmark — mobile or desktop. Keynote is wrapping up. Q&A with Thorsten Heins and the media later today.